What really hooked me on comics was John Byrne's run on Fantastic Four. When I was 11, 12, 13... every issue seemed like it had something in it that completely blew my mind and got me excited to come back the following month. Granted, some of that came from echoes of what Stan Lee and Jack Kirby did, but Byrne always handled things well and every issue was a new adventure that I couldn't wait to dive into. That excitement and luster faded with time. In part, the issues after Byrne left were less than stellar. No offense to Steve Englehart -- he had his hands tied so tightly with regards to what he could/couldn't do that he refused to put his name on the book after a little while. While I still enjoyed the book, and other Marvels that I had begun acquiring, they didn't have the sense of eagerness to dive into a new issue as soon as I could. Since I was still too young to drive, I was dependent on my parents taking me to local comic shops and/or conventions. With all the time I would spend scouring back issue bins, Dad discovered that they were other comics besides superheroes that were interesting to him. It was during that period that he picked up Watchmen (while it was being serialized in pamphlet form) and The Dark Knight Returns. I read those books after I had read and re-read my own, and they were pretty mind-blowing as well. At the time, I'm sure I missed quite a lot of the nuances and subtext and meta-commentaries that are embedded in them, but they were new and insightful books. As they were for everybody, but I was still young enough that I didn't realize that. I was still in the stages where it didn't take much to trip over something that was new to me. But that luster continued to dull with time. Again, I was still enjoying comics but the excitement of a new issue wasn't as great. Hardly surprising, of course. As I read more comics, I became exposed to more aspects of it and could start discerning patterns. The story beats started sounding familiar, and much of my interest was switching to the specifics of the execution. 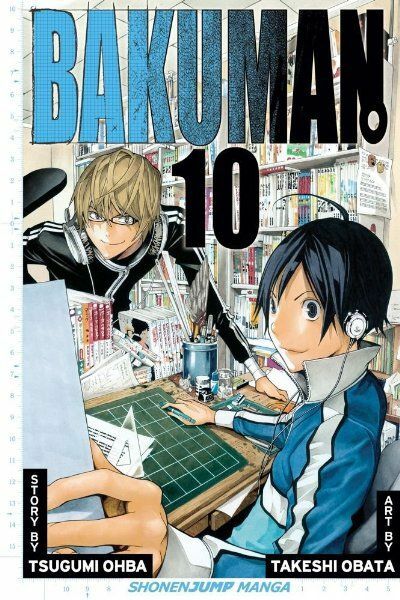 Tonight, I just received and read through Bakuman volume 10. (Yes, I know. Only barely in advance of 11 coming out. April and May have been crazy busy for me.) I found myself, for at least the fourth or fifth volume in a row, laughing out loud while I was reading it. Not for the comedic moments, which are there and well done, but for the sheer enjoyment in reading it. It is such a well done book, with a fantastic (and educational!) concept and really well-defined and relateable characters, and it has a story in which I have no idea where it's going to go next, it's just a phenomenal joy to read. I've had fun books that I've read over the years and a variety of "current favorites" but this has given me the most excitement in anticipation and pleasure in execution that I've gotten from a comic in decades. I really have to go back to my earliest days of reading comics to recall a series I got this much out of. I don't say this tonight as a review, or necessarily even as a suggestion. I'm sure there are any number of reasons why this title might not be your cup of tea. But I mention it as a way to reaffirm that it's still possible, after decades of getting increasingly more jaded, to still experience a joy that's very much like what got me into comics in the first place. Thank you, Tsugumi Ohba and Takeshi Obata.